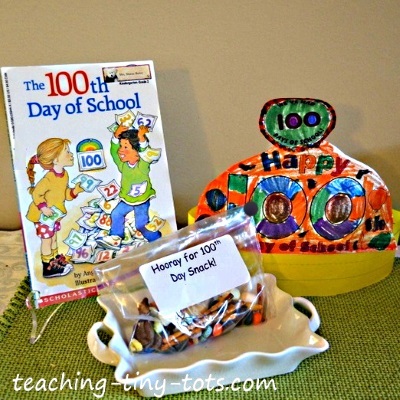 For Preschoolers and Kindergartners, the 100th day of school marks a huge day. Here are a few activity suggestions for classrooms and homeschooling. In first grade collages were made to celebrate this day as a grade level activity. Small snacks like pretzels, goldfish and raisins. Marshmallows, m and m's, gummy bears, popcorn and cereal are also fun to add. Read The 100th Day of School (Hello Reader!, Level 2) or read books of your choice. Be sure to see more of our suggestions below. Have all materials ready, snacks in small bowls. Have children count out a 100 pieces to put in their bags. If you prefer, have parents come in to help and let them handle the food while the child counts. This can be done in a center in small groups instead of the whole class. Put label with name on each bag. This was how the First Graders celebrated the 100th Day of School...all children were given a piece of cardboard or construction paper to take home and bring back their 100 item Collages. These were hung outside of each first grade classroom. 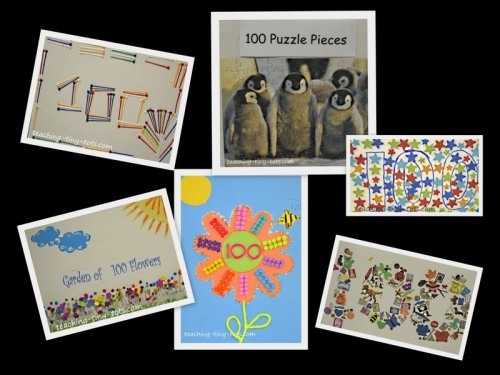 Children used pictures, toothpicks, puzzle pieces, stickers, foam stickers, beads, small objects, cotton balls, Q-tips. It was very cool to see all the creative collages!